A functionally sound and aesthetic master bedroom can make all the difference between a happy marriage and a not-so-happy one. A functionally sound and aesthetic master bedroom can make all the difference between a happy marriage and a not-so-happy one. And, even if you're not hitched and have all that space to yourself, a little planning with regard to your closet space can add that edge of organised neatness. This is the most convenient sort to have in your bedroom, especially if space is not a constraint. Offering depth and multiple levels, storage options in these closets are vast. Section it into zones to create easily accessible spots and out-of-reach areas where you can store seldom-used items. Utilise all the available space on the floor and right up to the ceiling by placing bins, roll-out boxes and install an extra pole if you can fit it in. A ceiling higher than nine feet allows this, and it is perfect for hanging summer coats. 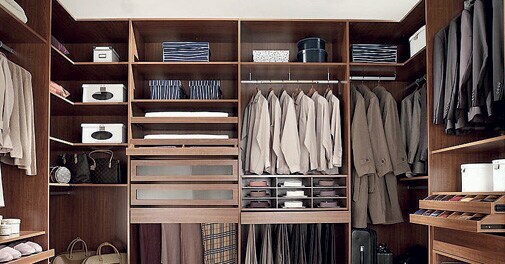 Have drawers and shelves slotted on the basis of your habits. If you bunch socks instead of folding them, allocate a larger shelf. Similarly, you need more height in the long slots if you prefer to hang up shirts rather than stack them. If there is a mirror fitted in the closet and you are likely to get dressed there, install wooden or vinyl flooring and don't carpet it. This makes vacuuming a breeze. This is a sensible option if you prefer the feel of roominess and do not hoard a lot of clutter. Instead of doors, cover the slot with a curtain. Searching for tucked-away things becomes easier because you're not constantly shoving the hinge doors away with your elbows. Sliding doors and bifold doors are convenient if you do not want to opt for curtains. Maximise space by installing a double-tiered hanging rod and hooks to the back of the closet. Cube organisers and drawer units are smart additions to a reach-in closet with a depth of 30 inches.